The huge log jam known as the great raft, stretching some 120 miles along the Red River, had given birth to the 150,000 acre Caddo Lake, described as the largest natural lake in the south. In 1832 Captain Henry Miller Shreve was hired by the War Department and charged with the task of making the river navigable to increase trade and the young nation's defense. Captain Shreve created a boat with a battering ram and with the clearing of the log jam - a city - Shreveport. Shreveport's population had reached nearly 17,000. Land sold for an astronomical two dollars per acre. 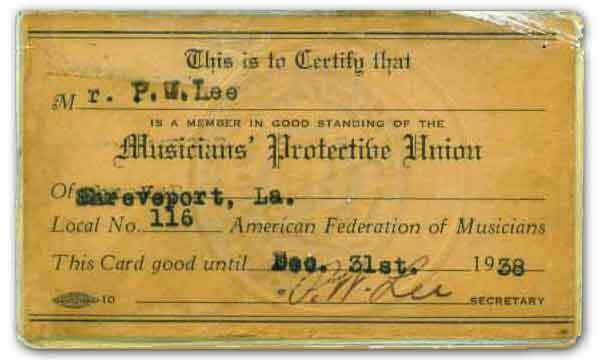 The American Federations of Musicians of the United States and Canada formed the Local 116 in 1900 to advocate for musicians. Also in 1900 Buddy Woods, Kid West, and Joe Harris were recorded for the Library of Congress. In 1903, eager to move beyond the Mardi Gras atmosphere it had earlier encouraged, city founders designated a red light district for the habitation of women of immoral character. This district, centered around Fannin Street, ran from the east side of the bottoms some 8 blocks to the riverfront where you could waive to Annie McCune. Barrel houses, juke joints and gambling establishments were the hit of the day on Fannin Street and a young Huddie Ledbetter, or Leadbelly, got his first taste of city life and the sounds of the night. Area folk music made famous at sukey jumps and house parties began to be recorded on Edison Cylinders. In 1906 the deafening silence of the crickets was shatterd by the discovery of oil on Caddo Lake. Oil City was a boomtown, made famous in Noah Moore's Oil City Blues. Sleepy little Mooringsport came to be know as Derrick City. Land skyrocketed to over 10 dollars per acre. Shreveport Doughboys marched off to war over there. This card was issued to P.W.Lee in 1938. Music was recorded on acrylic acetate discs and ran at 78 rpms and played on your phonograph. This army marched to a different beat. Two words: Elvis Presley. Music was now recorded on vinyl and played at 33 1/3 rpms on your record player or jukebox. Everyone wanted to know what the teenagers were doing. Either KWKH or KEEL was on the radio in your dash, but only until 7pm then make way for the clear channel skip. The Bossier Strip ruled the roost on Highway 80. Think Brat Pack with a Louisiana drawl. According to local Historian E. Starkley, Merle Kimmberly's Sak's Boom Boom Room, in later years called Sak's Whisk-A-Go-Go, was popular hot shop. The transitor radio put music in the hands of the increasingly mobile masses. Jerry's Saloon on Texas Avenue was a dark place to get away from it all. It was the 1970s and 1980s near the riverfront on the Shreveport side of the Red River and bands like A-Train, Danny Johnson and The Bandits, and Red Hots worked nightclubs like Humphrey's, Circle In The Square, and Sportspage. In Bossier, Southpaw was at the Flow Reg. At The Key Note, Ernestine sang and Raymond Blake played a Flying V guitar. The Million-Dollar Sandpiper reminded us of days gone by. In 1980 LPs were still in charge, 8-tracks were cool, but cassettes and compact discs were taking over Stan's Records. Sony created the Walkman. The speed limit was reduced to 55 mph in an attempt to reduce our dependancy on foriegn oil. Shreveporters now have FM radio and KROK, KMBQ, and TUX99 are added and or subtracted from the airwaves. The gambling boats came to town in the 1990s. The fat cats rolled and the music was wall to wall and 24/7. Compact Discs took over the market place, unless you were a hold-out for the warmth of vinyl. SUVs and boomcars with big stereos were the way to go. The multidisc changer was located in the trunk of your car. The World Wide Web emerged and everyone went online to the sound of a dial-up modem. The lights are still on after Y2K. Music has gone mp3. Connections to the web are always on. Apple presents the iPod. In 2006, AFM launchs their exploration into cyberspace with this website. Music flows from the casinos, concert halls, auditoriums, backrooms, and front porches all around the Ark-La-Tex and AFM Local 116 is 109 years old. Like most Americans, musicians are filling the pinch. Some say the economic downturn of 2008 is the worst since the Great Depression, though analysts and experts on the subject say that this is nothing like that. So what to call this little thing that is going on? Some say we should just refer to it as the troubles. Whatever you call it, we are striving to excel and still jamming and staying in the groove. In the words of Sheveporter Michael E. Johnson, "Help me, Lord. Don't hurt me."